A true survivor and as close to original as it gets. Restored in the early 90's. 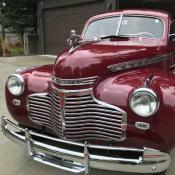 The engine was rebuilt and the car was repainted factory correct Ruby Maroon color. There are a few small issues with the paint but nothing major. The car looks great and runs and drives like it did when new. The dash is unmolested with the beautiful original steering wheel and correct wood grain finish. The radio is not functioning nor is the clock but both are there. The front shocks leak and need to be refilled occasionally. The rear main seal also seems to be leaking a little as well, probably due to low activity. Super car for a restomod or as a correct survivor collectible. I have valued this car below market so the listed price is firm.